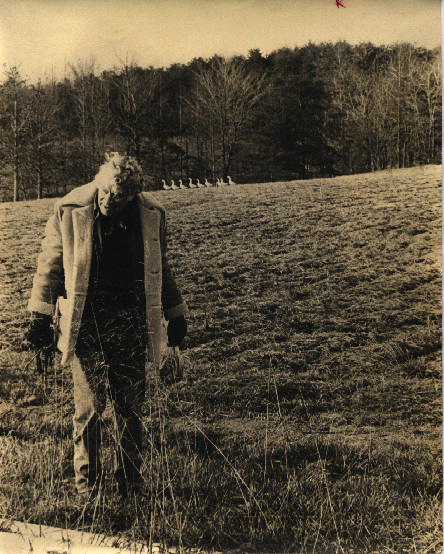 My photo of Euell Gibbons, foraging on a North Carolina strawberry farm around 1973. Seeing an opportunity to add a nice detail to the photo, I remember sprinting up from behind Mr. Gibbons to get a photo with the ducks in the background. Most of us who are interested in simple living and growing food also are interested in foraging. Here at the abbey, I have a growing collection of books on foraging. One classic that belongs in everyone’s library is Euell Gibbons‘ Stalking the Wild Asparagus. This book was first published in 1962. It became a best seller and has remained in print all these years. It was my good luck to get to go foraging with Euell Gibbons many years ago. He was in North Carolina at the time, and a friend of mine, a reporter, was writing a newspaper story about him. She invited me along to take pictures. After some early morning foraging on a winter day, we cooked breakfast using what we’d gathered. This was written by daltoni. Posted on Monday, June 14, 2010, at 9:56 am. Filed under Food, Sustainable living. Bookmark the permalink. Follow comments here with the RSS feed. Post a comment or leave a trackback.